You are currently browsing the tag archive for the ‘Dappo doragu; gohou doragu; drug abuse among Japanese youths’ tag. Two PTA meetings ago, talk circulated among PTA moms with a warning from one of the moms that candy-like “dappo or gohou drugs” (quasi- and ‘legal’ drugs) had been seen being handed out freely like free tissues, at the Machida train station (Tokyo) to high schoolers and younger students. Machida city is a favourite hangout location of high school students such as at my son’s high school, so naturally this raised my concern and that of the parents in our PTA circle. “Gohou drug” abuse incidence is surfacing again (in the media spotlight since 2008 known then as the “dappo doragu” phenomenon) and is increasingly being reported among as young as middle schoolers now… A Tokyo metropolitan health institute official was interviewed on this morning’s Asaichi TV program saying as many as 500 middle and high schoolers have been hospitalized due to dappo or more correctly, gohou drug abuse this year. See NHK TV ASAICHI 家族に忍び寄る！脱法ドラッグ. While “dappo” drug may remain on our consciousness due to earlier media coverage, less likely to be on the radar of even the most vigilant parents are the arguably more worrying and proliferating novel varieties of “gohou” (legal) drugs. One reason that the drugs are reaching younger and younger age groups, is that while they used to be reported as occurring as inhaled substances from herbal or aromatherapy incense, the drugs are now being distributed in new forms – many in cool or attractive and innocent-looking packaging like “gummy” candy wrappers and the drugs are given out on the streets free like tissue paper ads (or sold as health supplements in ordinary shops and restaurants) to entice young customers and increase the customer following. Lack of awareness about dappo doragu (or drug) and other new varieties of the gohou legal or quasi-legal drug stimulants among the young is resulting in the rapid proliferation of drug abuse, the exacerbation of a relatively new social issue concerning the young and youths. “Dappo doragu” and “gohou doragu” here in Japan, as in Latin America where they are widely available as anti-inflammatory and recreational drugs, they are commonly believed or thought to be “light” drugs or harmless substances. These drugs are often sought after and consumed by young salaried workers who have recently entered the job market, and who are looking for ways to help them increase energy and stamina, and improve work performance or concentration, or as a means to relieve stress. Hospital authorities said “gohou drug” consumption often resulted in severe irreversible brain cell death and damage, muscle paralysis and symptoms such as paranoia in the middle of the night. During the Asaichi TV program, a video clip showed an experiment of a mouse that had been fed the gouhou drug. Twenty minutes later, the mouse showed physiological trauma, muscle paralysis and its legs collapsed. The same symptoms are being reported in humans. The drug raises concern because of the severity of the symptoms and because there is no cure or way of reversing brain damage once it has occurred. Although the dappo drug problem and similar abuse stimulants called “gohou drugs” (legal drugs) came under the media spotlight from 2008, according to this morning’s Asaichi TV program, the law and health regulatory agencies have trouble keeping pace because of the number of new substances or stimulants that are being introduced on the streets … On the program, testing of one sample of gohou drug showed as many as 27 stimulant substances in the mix. Sold openly in a great variety of forms (of innocuous-looking packaging as herbal supplements, aromatherapy or more recently as candy, in street shops and some small restaurants, this is posing a huge supervisory problem for concerned community members and parents, Asaichi reported. Parents, guardians and educators are advised by the show to watch out for strange behavior, speech and smells in their children and wards. Needless to say, the legal and public response to new psychoactive substances is a problem not isolated to Japan, but is one emerging in other societies too, see Addiction to know more and access a collection of papers addressing the issue of the ‘legal highs’ market, one which only a few years ago was regarded as an area of limited significance. Things on the drug scene are changing rapidly, and today the question of how to respond to the challenges posed by the emergence of new drugs has become one of major international concern. The papers in this virtual issue highlight the need for a very different regulatory regime to address the challenge presented by a plethora of new psychoactive substances appearing on the mark. Only 13 percent of about 6,000 junior high and high school students in and around Tokyo think the use of “dappo habu” (quasi-legal drugs) is a matter of individual freedom, a poll showed Tuesday. Quasi-legal drugs are substances that are chemically similar in composition to banned narcotics but technically legal at present, and the abuse of such drugs among young people has become a social issue. In the Japan Drug Measurement Association poll, 13.2 percent of the respondents said it is up to individuals to decide whether to use those drugs, while 0.6 percent, or 37 respondents, said they had tried them. Nao Mazaki, an association official, pointed to the low awareness on how quasi-legal drugs can harm one’s health, and stressed the urgent need for the central and local governments to step up programs to disseminate information about them. The association, the Japan branch of the U.S.-based Foundation for a Drug-Free World, carried out the survey between September and December at six high schools and 11 junior high schools in Tokyo as well as in Saitama and Kanagawa prefectures. A total of 6,150 students, or 3,074 at high schools and 3,076 at junior high schools, responded. In the multiple-reply survey, 75.4 percent said it is bad to possess or use these quasi-legal drugs, 5.7 percent said their use is not bad if not banned, while 7.1 percent said it is bad to use them but not to possess them. The rise in popularity of Dappo Herb has led to an explosion in the number of shops selling the stimulants. 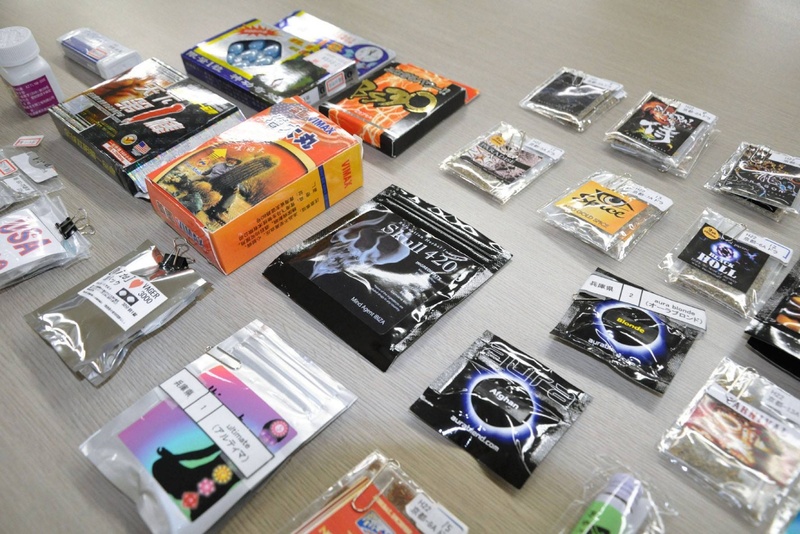 “Dried herbs mixed with stimulant chemicals carefully packaged to dodge drug laws are gaining in popularity among young Japanese, leading in turn to a drastic increase in the shops selling such products. These “dappo habu” (law-evading herbs) contain stimulant materials whose chemical components are slightly different from those prohibited by drug laws. The Tokyo Metropolitan Government identified two shops selling such products in fiscal 2009. As of last Friday, 89 such shops were in existence, many of them in Shinjuku and Shibuya, areas popular with young people. “Even if (herbs) do not include chemicals designated (as illegal) by law, you can’t say they are safe. (Inhaling them) is like conducting a human experiment with your own body,” said Masahiko Funada, who heads a team researching addictive drugs at the National Center of Neurology and Psychiatry in Tokyo. The Health, Labor and Welfare Ministry has been locked in a race with dealers as it keeps adding new stimulants to its list of illegal drugs while dealers keep marketing new products, including new chemicals they say are not covered by drug regulations. The ministry recently decided to introduce a new and more comprehensive system for designating illegal drug components. Even if dappo herbs don’t include illegal chemicals, selling them can be a violation if the seller specifically instructs the buyer how to use the stimulant, such as by inhaling. Many of the shops, however, are cagey enough to evade the law. They sell the dappo herbs as “incense,” not something to be consumed or inhaled directly. Police and local governments have recently started cracking down. In January, two shop managers in Osaka were arrested for alleged possession of illegal drugs for the purpose of marketing them.